My family and I recently adopted Tinkerbelle about a year ago in March to help keep my father company at home. Tinkerbelle traveled a far journey from her original home in Louisiana after her owners could no longer afford her medical care. Tinkerbelle has underwent many surgeries for her eyes, thanks to your services and has recovered magnificently. Thank you for bringing Tinkerbelleinto our lives, she has certainly put a skip in all of our steps and a permanent smile on our faces when she greets us every morning. 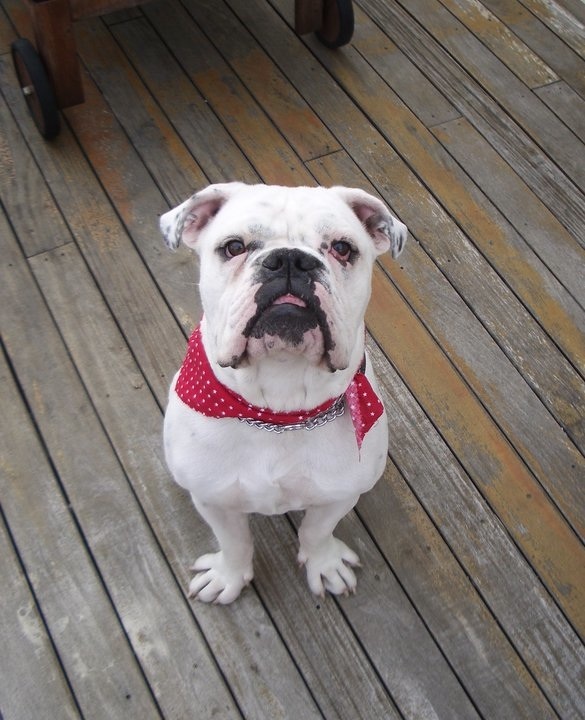 When my husband and I were ready to adopt a dog we didn’t want just any dog, we wanted an English Bulldog! We searched and searched for a rescue agency that was dedicated, knowledgeable and passionate about the breed. We found all of these traits in MidAtlantic. Joanne and Cathy helped us find our two angels. Dale, who was only a puppy living in a hoarder’s home in Massachusetts and Tun-Tun who’s family was in the military and was being deployed. We have had a wonderful experience working with Mid Atlantic and recommend them to almost everyone we meet! 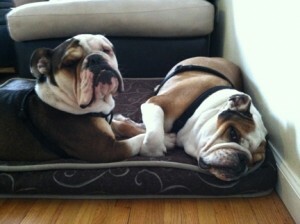 Thank you Mid Atlantic Bulldog Rescue for changing our lives! We highly recommend Mid Atlantic Bulldog Rescue! We found Floyd on Petfinder.com and Mid Atlantic Bulldog Rescue was prompt to respond to our inquiry and immediately set up an appointment for us to meet Floyd. Mid Atlantic Bulldog Rescue was very easy to work with; they took the time to talk with us extensively to make sure all of our questions were answered. We were also assured that if we ever had any concerns throughout Floyd’s life, Mid Atlantic was there to help. We continue to send updates about Floyd and hope that everyone has the opportunity to have such a wonderful dog. 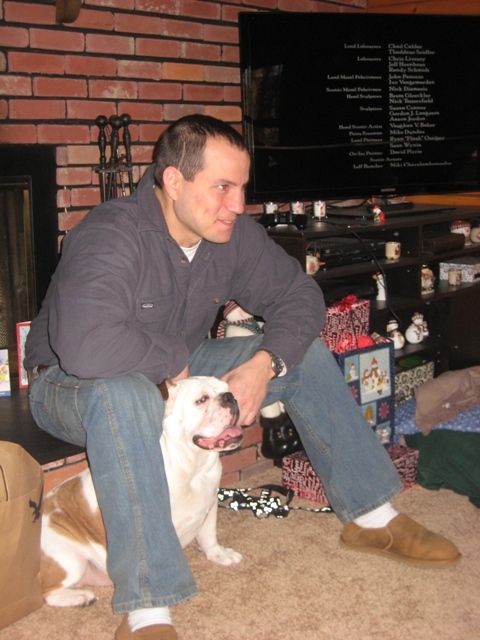 My wife, Renee & I owned a bulldog, Duchess, almost 10 years and became VERY attached. Duchess lived great life but it did come time to say ‘good bye’. We were devistated. Previously I had done some research and became famiar with MABR. 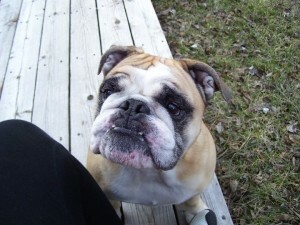 I reached out and explained our situation and desire to give a bulldog a good home. Immediately I knew I made the correct choice. These folks showed us compassion and helped us (try to) replace our loss. Their responsiveness was and remains excellent, especially considering they are a volunteer organization. We met with Joanne Hale of MABR to explain what we could offer and what certain bullie might be the appropriate choice for us. Joanne mentioned that they had a male bulldog, MAGIC, that was in need of a good home. I was instantly ‘sold’ on the idea, however my wife Renee wasn’t as easily convinced. Joanne listened to her concerns and explained the situation and made my wife feel comfortable in moving forward in the adoption process. 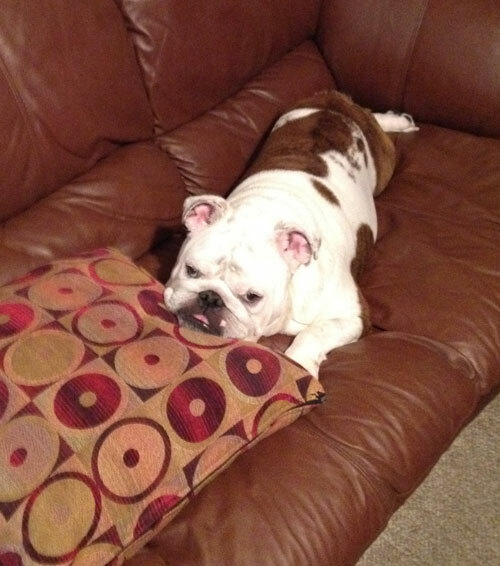 It is indeed a process making sure both the family and bullie are a match for each other. 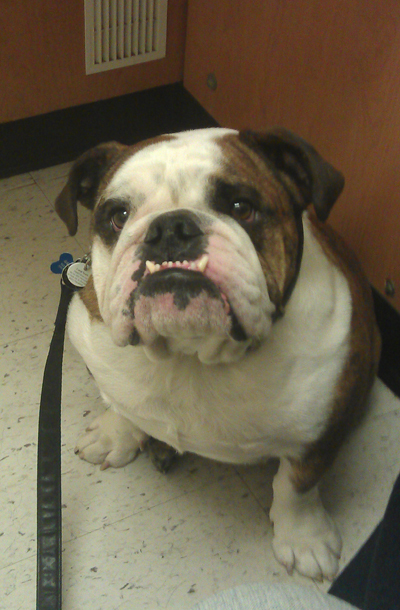 Joanne definitely had questions for us to assure a proper match, including making sure our situation was suitable for a bulldog. I appreciated the idea they weren’t just placing these dogs in just any home. The day finally came for us to get Magic. We couldn’t be more grateful to Joanne for her efforts to assure a smooth transition for Magic to live with us. Joanne picked Magic up at his then home in New York (Long Island, I believe? ), then brought Magic back to her home in New Jersey to get him ready for his new home. We live in Pennsylvania and Joanne brought him to us. She stayed for quite some time to assure both Magic and us we settling in with each other. Living up to the name of the group, Joanne travelled the Mid Atlantic area on our behalf that day. Wow, now thats commitment! It is my understanding that this type of travel is just a small example of where they go and the extent they go to help bulldogs in need. It was a learning curve as they say for both Magic and us but with patience, persistence and understanding, I could not be happier with having Magic live with us. Or do we live with him? If you know bulldogs you understand the question. While Magic will never replace our bullie Duchess (and shouldn’t) I found my new best buddy. Magic has adapted very well to us and us to him. It is truly a great match. He has filled a void that I thought couldn’t be replaced. So with all the above being said…….. 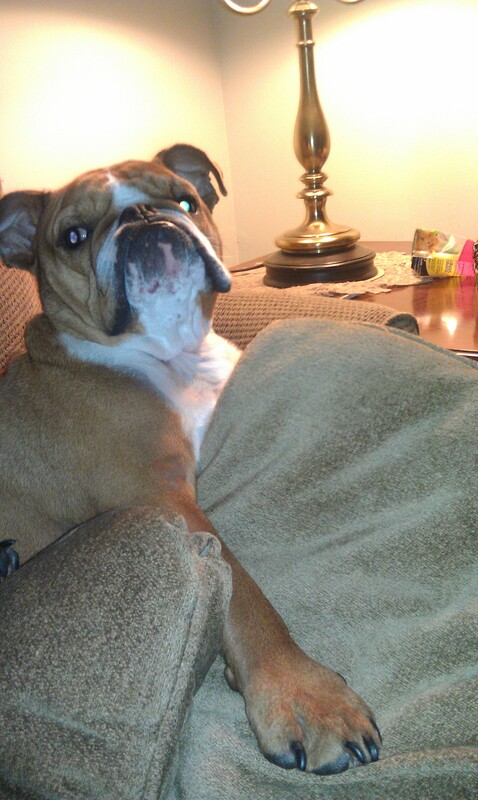 I without hesitation would recommend Mid Atlantic Bulldog Rescue for anyone that wants to adopt a bulldog. Trish and I have never been happier since Hurley joined our home. 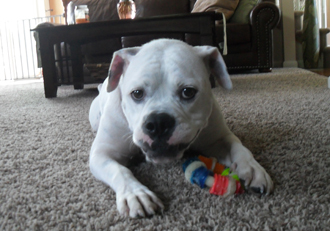 We are thankful everyday that we had the opportunity to adopt such a loving, playful dog as our own. The joy and laughter he has brought our lives can not be measured with words. Our endless thanks to you, and MABD Rescue, for all the work and dedication your people show to these Bullies. Please feel free to contact us for future status on Hurley & we’ll be sure to send more pictures, as my phone has too many to count!!! Duke is adjusting wonderfully. He is part of our family!!!! Thank you. Thank you so much for doing what you do! Wish there were more people out there who cared about saving animals, the world would be a much better place. I just wanted to reach out to you and say Thank you so much again for bringing Kayden into our lives. Kayden has been wonderful from day one. He has definitely won over all our hearts in our family. He has had no adjustment issues at all and is such a lovey and quiet the cuddlier. There is no lap safe from his presence, and there is not one individual that is complaining. I just wanted to touch base with you and let you know how grateful and happy you have made me as well as my whole family Kayden really brightens our days. I also have attached a few pictures to let you see Kayden King of the Home.